I hope today’s race will get me ready for the Davis Stampede 1/2 Marathon. God has provided all my needs yet I’m anxious because of a problem I’m having with my email. Troy and I have been writing race stories and sending them out for years. Recently, our new server has been sending this email multiple times to some of our recipients and filling up their inboxes. On the drive to the race, I saw that someone had received a dozen of the emails. I panicked. I don’t want the email to be a problem, but an encouragement. I thought we had fixed it. We text a few friends hoping to confirm that it had stopped. The race is ready to start and still no confirmation. Clearly I have to leave it up to the Lord. Lord, forgive me for not trusting you and, instead, getting upset on the way here! Troy, I, and the girls pray. I feel a sense of peace…He’s in control. No matter what, it’s going to work out. Thanks in advance Lord for that! As I jog to the start, I see a race beginning. Is that the 10k starting?! I tense up but am reminded that it doesn’t matter, He’s in control. 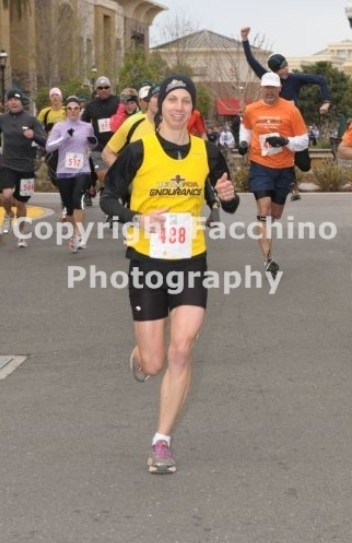 I find out that it was the 1/2 marathon…thanks, Jesus! With a few minutes to spare, I thank my wonderful family for being here and I tell the girls I’m excited to hear how their races (Kids 1 Mile) go. I line up and don’t see many women. I hope to find some to pace off of. Ready, set, go! As I run past, I give Anna & Ariel a high five. Our sweet girls! A handful of guys take off and I try to hang with the back of their pack. My goal is to run faster than my planned 1/2 Marathon pace. Right away, I feel a bit tired but I stay hopeful that it will get better. We run down Galleria Blvd and mostly have the road to ourselves. It’s a long stretch but soon we turn off onto the bike path. I don’t know the course but hope to find the way staying with these guys. Mile 1 is 6:39. Okay, that’s good. I don’t think I can go any faster. I pass a few guys and keep looking ahead. I catch a young guy and cannot make the pass stick. He surges ahead. I try to maintain my speed. Mile 2 is 6:39. I’ve only gone 2 miles? Ugh, it feels like 4! I catch up to the kid again and he sticks to me. Well, I was looking for someone to pace off of and here we go. I won’t complain. We see the leader already running back from the turn-around. We both agree that guy looks fast and is fast! We make the turn-around and chase after the guy in front of us. Mile 3 is 6:42. This continues to be a challenge! I just want it to be done but I know that painful races like this are good preparation for the racing and training challenges ahead. I have to keep pressing on. Lord, help me just do my best and not let up! The kid and I catch the next guy. Thanks God! Mile 4 is 6:32. Great! I’m encouraged in my pain and it keeps me eager to press on. We catch up to another guy. We are getting closer to Galleria and soon we are climbing up to it…ugh, this hurts! We get to the top of the path and then follow the 5K route on another section of path. One of the guys we passed surges ahead. I don’t even try to follow. I’ve got to stay steady to survive. The young kid attempts to catch him and makes a great effort. Mile 5 is 6:40. We jump off the bike path and hit a hill going into a neighborhood. Oh boy, on a good day in Auburn this hill wouldn’t be bad, but it’s a tough day today! At least we are all suffering together. As we descend down, the guy who passed us takes a wrong turn. In my exhausted state, it’s not so clear what is happening. He realizes his mistake and gets back on track as we catch up to him. I realize the course is headed straight for another hill! It’s the only way back to Galleria. I prepare as we approach it. Here we go. It’s not so bad but it’s still an effort. Thanks God! I get to the top and can see the real challenge is the steady incline back to Whole Foods. Again, I ask for help on this last bit. The kid and I are neck in neck. If he takes off, I don’t think I can react. Still, I encourage him to push hard and hope that I can follow. Mile 6 is 6:50. I’m happy with that considering the climbing! The finish is close and I’m excited to be done! The kid takes off with the other guy we chased. I cannot react but I keep trying. I see Anna ahead ready to finish with me. I grab her hand and we race off. “Come on Anna, you can do it!” We finish together and I’m happy and relieved. “Thanks Anna! It’s so great to finish with you!” And, thanks, Jesus for getting me to the end!! It’s been a tough day but a good one! I soon find out that our email situation was minor and all is well…phew! Again, thanks, Jesus! Robin is racing the 10k. Anna & Ariel are at the start of the 1mi kids run following a warm-up routine by the familiar running clown guy. Anna is at the front, right on the line. Ariel & I are near the back. We met another 3 yr old, Aiden, doing the race, too. Brad Kearns gives everyone instructions and warns the kids not to knock each other over at the start. Ready, go! As the pack bolts off the line, Ariel and I slowly make our start in the calmer section of runners. Despite her longest race yet, Ariel has stated that she’s going to run the whole course. She’s got a good efficient jog going and a joyful smile. Only 100ft into our run we see a kid down. It’s Anna! Another parent is with her making sure she’s ok. She got knocked down and a little scraped up but I think the surprise of it all is what’s really causing the tears. We pull to the side, check her over, and Anna says she’s going to continue on. Here we go. Ariel is still determined and making it look easy. While Anna is transforming from a slight limp to a full stride. I’m so proud of my girls. They both have smiles and are having fun running. I think Anna is finding out it’s also fun running from the back rather that at the front… because there’s lot’s of kids to encourage as you go by. Ariel is making good on her promise. Not stopping. Just playfully jogging along. Unknowingly meandering left and right. Nearing the finish, here comes Anna, running back to finish the race with her sister. Suddenly Ariel is getting some chafing… in those sensitive areas. It stops her momentarily, but seeing Anna coming to help gets her going again. Somehow she ignores the chafing and finishes, running the rest of the way! We wake up to a beautiful day! Thanks Lord! Considering we were biking in the cold rain last year, this is purely delightful! I get to our meeting place, the Overlook, first. Karen Nichol and her friend Nicki show up first. I just met Karen and her kiddos at the playground just a few days before. It's so exciting to have more women out here to compete along with Jessica Bonner and myself! Troy shows up with Bob Funk who he just bumped into and talked into doing this event...nice! Once most of the gang is here, the girls and I start out to get a head start on the "warm-up" part of the ride. We meander through Newcastle, come up steep Glenview, and fly down Hwy 49 to the confluence. Troy and part of the group comes along and soon the fast dudes (Kayden, Lance & Michael) pull up. Lance got a flat and was able to swing by home and fix it right up. After Troy reviews the start times, he reminds us that the age grading is in place and can change things fast! Climb #1: The girls and I line up. I signal Troy and count down to the start. As I roll out, I feel pretty good! I'm wonder though if I have enough training in the tank to sustain me. I sacrificed a week and a half of bike training while I was working on a video for my Dad's 80th birthday party. We'll see. I hope to make it to the halfway point before any of the guys catch me. In the first mile, I have a small lead on Jessica. I can tell she's pushing it hard so I cannot let up. I still feel really good surprisingly. Thanks Lord for letting my legs feel so good! After I reach the halfway point, I see no boys! What?! Where are they? Did they get a late start? I reach the flat, fast part and take advantage. I push hard and get a good momentum going. As the road curves and I can see the road behind me, there is no one in sight. Wow, that's a surprise. I'm tempted to rest up but I know I need to keep riding hard as if people are right on my wheel. I see the sign for the stop sign and push hard to the top! 17:13! I think that's a pretty big personal record (19:?? previous best). I'm so tired that I find myself riding in the middle of the Foresthill Rd. Oops! Thanks God for keeping the road clear! That could have been bad. As the others finish, I try to make sure they don't make the same mistake in their fatigue. There are lots of records, our event and personal ones, being broken today! Jessica had an amazing improvement and only finished seconds behind!! Lance and Michael were neck and neck the whole way to the last bit. Bryan, Kayden and Troy were not too far behind and did great! David Malicoat and Karen finished seconds apart. And Bob and Nicki also made great efforts. Climb #2: We ride over to Foresthill Bridge. Construction has closed one side of the bridge making all the car traffic squeeze on one side. Kayden suggests that we ride across single file in the order we finished (without the ability to use our excel spreadsheet on our phone, we don't know the current placing). This way we'll have strength in numbers with the cars. The race "starts" as each of our wheels cross the bridge to the Auburn side. I like it! With the bridge clear from behind for a moment, we all head out. It's so cool to be in the company of all these great cyclists. We definitely are creating a great buffer for each other! As we cross, it begins. I feel like I can fly! I pass up Bryan and it seems as if I'll glide right up to the rest of the guys! Then reality sets in and those guys float away big time! Boy, I must have lost air to the brain! To think I could've caught those guys! Bryan comes up and passes. "Go Bryan, you've got it!". I have been humbled! I give what I can even though the wheels are coming off! I finish and thank the Lord for His protection and for the abilities He's given me. It's been a great ride! I have no complaints! I cheer on the rest of the group as they push hard to the top. Everyone has given a great effort! Now it's time for part 2!! This is Anna's 2nd 5K and on the same course. Last time she was at 4 years old running/walking with Daddy. They did a 56:13 so we think she will be able to beat that by quite a bit at 6 years old and with a lot more running experience. Either way, we hope it to be fun for her! I find myself frantically trying to get ready for the race and get my equipment in order. This is not a good way to start the day and it's not a good example to others around me, especially Anna. I fail to focus on the fact that Anna has downed a juice box and a bunch of food at the athlete food table. I don't think it's a big deal because she's young and can "handle anything" right? We line up with a few minutes before the start and Anna tells me she has to go potty. "Why didn't you tell me sooner?" I am frustrated yet it's really my fault for not asking her sooner. The race director is looking to start the race now. What to do? The race director announces that the race will be delayed 5 minutes. Wow, thanks God! That sure helps a whole lot! It gives me a moment to re-group and apologize to God, Troy and Anna for my attitude. Racing is not about me but glorifying Him...and that includes the pre-race attitude! Troy and I help Anna find a "potty" and we make sure she's got her shoes tied and all that. Phew, I feel like all is good. Jesus, I am humbled and thankful for You loving me despite my selfishness! Anna wants to start in the front and I encourage her to move back. With the great weather today, there are more people to look out for so I want to be a bit cautious. The first mile is all downhill, and a lot of that steep, so I expect to be pulling back the reins so Anna won't go too fast. Okay, it's go time! Anna takes off fast but within 100 yards she's slowing down and holding her shoulder. "It hurts Mommy!" I wonder what's going on. Could it be a cramp? I encourage her to keep running even if it is slow. Now we are descending into the canyon and she sees her friends, Dash, Devon and Mason cheering on the sidelines. She gives Dash a high five and takes off in a flash down the hill. Wow, look at her go! It's not long before she's walking and whining about her shoulder. After seeing her take off when inspired by friends, I wonder if she might be exaggerating. I ask her if she wants to quit and go back to the start. As soon as she hears the word quit, she tells me earnestly she wants to keep going. We start up again and now she's holding her side. Yep, it's a cramp. I should have curbed all that drinking and eating. Running on a full tummy.. ouch. A nice lady from behind tells her to breath in deeply. I encourage her to keep doing this. There is a smaller kid right in front of us and I know there are other kids around her age further up too so I use these "carrots" to distract her. I also say we need to keep going so Daddy won't catch us. Lord, please help her get through this pain. Please take it away. Mile 1 is 14:31. She can run a 10 minute mile on the flats so this cramp is really cramping her style! Now we start to climb. We pass the little boy. I encourage her to catch up to a bull dog up ahead. The hill gets steep so we walk a few and then run a few. Eventually we catch the dog doing this pattern. We make it up to the top and see the aid station. She loves this part. She grabs a cup, drinks a bit and pours the rest on her head. It's actually feeling really warm and I ask her if she wants me to pour some water in our bottle on her and she agrees. Ah, that's more like it! I can see some of her spark coming back. Mile 2 is 17:03. It can only get better from here! Anna is complaining less and less about the pain. I tell her we have 4 laps on the track to go and she perks up more. Those kids I told her about are coming into view. One by one we catch up to them. Anna tells them good job as she passes and that makes me the most proud. We run into some pretty steep parts and she keeps trudging up. She's really enjoying herself. Thanks God for helping her feel better! The 10Kers are catching up to us now so we have to pull over to let them pass. "Okay Anna, one lap to go on the track! Daddy cannot catch up to us now!" I can see her physically gearing herself up to go and she talks excitedly about crossing the finish line with Ariel. We pass another kid as we start climbing out of canyon and into the parking lot around the corner from the finish line. Mile 3 is 15:47. "Come on Anna, Ariel is waiting!" She picks it up and calls out Ariel's name. Ariel is busy getting her hair done and it takes a few moments for her to realize that Anna wants to finish with her. Anna waits patiently and triumphantly finishes with Ariel. That is super cool! Thanks Jesus! It's our annual TeamSoares challenge of biking and running the first day of the year. Last year there was rain and sleet. This year it's proving to be a perfect day with a chilly start. At the Overlook it's exciting to see who shows up. I meet two new ladies, Karen and Nikki. Fearless Jessica Bonner is here. Bob Funk just happened to be riding by and I roped him in. Dependable David Malicoat is always up for a ride. Bryan, the cross-country runner is ready. And here comes the pain inflictors: Lance Loveday, Michael Cook, and, the last to arrive, Kayden Kelly who, despite being sick, smiles just because he's on his bike. The ladies are ready and head out first. Soon when give chase. We warm up with 10 miles through Newcastle, including a climb practice up Glenview Dr. We all shed layers. The pain inflictors are now far ahead. The rest of us continue by the bike shop and then down the graceful sweeping turns of Hwy 49. The sparkling river below makes for stunning views. At the confluence we prepare for the first challenge. The pain-inflictors arrive late after a flat tire repair. It's a 3mi climb up Old Floresthill Rd. It's a popular www.Strava.com ranked climb. This will be a good chance to see how we rank against the rest of the biking community. The ladies take off. Followed by the "over 50's". And then the rest of us. The climb is on. In my group, Michael sets a blistering pace. At first everything feels great. I imagine holding until 1/2 way and then putting on a remarkable sprint. But after the steep beginning, the feelings of racing heart rate and loud breathing force me to focus more on surviving. Up ahead, Michael is chased by Lance and Kayden. Kayden, even sick, looks so relaxed and fluid out-of-the-saddle on the steep parts. Near me is Bryan. Around some more corners we start to see Bob and David ahead. Farther up I think is Robin. I'm trying to be very efficient, lifting my knees, getting lots of oxygen, being in the right gear. I'm amazed how hard this hill always feels even after I entertain great aspirations of speed. I pass Bob and then David. But this challenge is age-graded and they've got 10 and 20 years on me. I got the age-grade factors from the official WAVA tables but still don't know how it's going to play out. We're all just doing our best. I pass Kayden which is inspiring. I know I'm having a good ride. Who I thought was Robin was really Karen. I don't see Robin, Jessica, Lance or Michael anywhere. With a mile to go I near the reprieve - a flat section to be taken advantage of. But every part of my body just wants to rest. Must push. Where others rest is where advantage can be gained. Moments earlier, Lance had used a different strategy.. pushing hard to get on Michael's wheel to rest through the flat and put a final surge past him at the top. Fine bike-racing strategy. Even with a great push through the flat, followed by one more painful effort, I'm still unable to catch anyone else before the finish. Wow, that hurt! My throat is sore from breathing hard. Kayden, right behind me says the same thing. All the efforts were well spent, however, as we start calculating personal records for everyone. I was 15:22. Lance was 14:20. Even David Malicoat who, after turning 50, seems to get faster each year. We take a picture and re-group for the cruise down to the Bridge. The Foresthill Bridge, tallest in California, is the start for the 2nd and final climb. We line up in order of current placing. Lance at front and me at number 3. We remain neutral across the bridge and then hit the throttle for the .5 mi climb to the top. we started right on each other's wheel. Sure enough, Kayden, was right. He thrived on this start. Riding faster than before he passed me and moved up to Michael. Locked on his wheel. And then surged by him to go after Lance. But no one was catching Lance. He put on a phenomenal burst near the top and just rode away from all of us. At the top we gasped as usual for a while until we were all able to say, "great job, we're glad we did it". And then grouped up to head back. Arriving back on the Overlook, the scene was now bustling with runners. The perfect weather was drawing a record crowd. We hustled back to our houses to get changed and line up for the run. This was important because our run placing will be added to our bike placing for the overall ranking. Michael and Karen are the current bike male and female leaders. Robin leads the relay division. Robin's runner will be Anna doing the 5k. David Malicoat's runner is Dave Campbell. And Jessica's is John Doolittle. Dave is fired up and tells me that I have to run 10min faster than him to win an age-grading comparison. Even straight-up it'll be a challenge to beat him but I think it's possible. Dave, Michael (3rd), Bryan (5th), Karen (8th), John Doolittle and myself (6th) are doing the 10mi. Lance (2nd) and Kayden (7th) are doing the 10k. It's going to be a challenge to move up. I'll need a top 3 finish to have a chance. At the start it's exciting. Robin and I lose Anna. We find her right on the start line with 500 adult runners behind her! We take her back where she'll be safer. 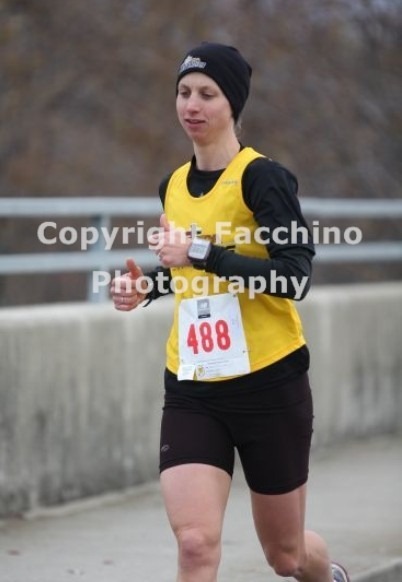 I've been so excited for her today, doing her 2nd 5k and running well lately, that I haven't prepped well myself. Go! Everyone starts so fast. I'm feeling a little slow but always confident I'll work back up. At the split, the 5k/10k'rs head down the brutally steep dam road while the rest of us take the gradual 2 mile descent. At 1 mile I can barely see Dave Campbell and Michael Cook down below with the leaders. How are they running so fast? They must be 5:30 pace. Almost to the bottom I'm a little concerned I'm working hard going down. Ok, the first climb. Up the rocky trail. Maybe I'll start feeling better. I work hard. I pass a couple girls, telling them good job. And a number of guys and some young kids. I'm breathing very hard when we reach the flatter parts. 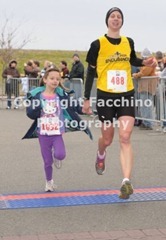 A girl in white catches back up and we match pace for a 1/2 mile. At 3.6mi, my legs suddenly get tired and heavy. I'd been confident despite the signs up to this point. Now it was clear that I was bonking. The hard effort on the bike took a lot out of me. I don't have food. I haven't hydrated enough. The girl in white quickly pulls away. It's suddenly very difficult and yet there are 6 miles to go. I will continue doing everything I can because you just never know what might happen. We're running down the steep dam road and I hope for recovery. But the jarring is not much less difficult. We're back on the trails. It's actually getting hot. My legs feel like cement. I'm humbled and amazed as I think about the remarkable running performances of Michael, Dave, Robin, and even Lance and Kayden, the bikers that run once a year. This was my first time running this course after the bike hill climbs and it's tough! I had been saying "I'm not going to walk" but soon a couple steep sections bring me to a walk. Wow, this is tougher than expected. One thing that's great in times like this is the heart-to-heart talks I get to have with the Lord. I'm reminded of my reliance on Him, and how many times He's helped me, despite some of my decisions. I know He'll get me through. I know I've taken things for granted. I'm reminded that a strong person is a repentive person. At 6mi, I see Michael coming back. He's 2mi ahead of me, looking strong, I'm staggering along and he still says, "come on, Troy, catch me!" Always the optimist. At 7mi it's so great to make the turn-around! It's still a painful struggle. Now I see some other runners like Mo Bartly coming up behind me and Christine Kelly wearing a "Hapy New Year" crown and having a great time. Even though I know there's many hilly sections to go I keep thinking there's not. Like the trail suddenly changed and became a short climb to the overlook. But first there's the Robie pt climb, then up to the fireroad exit, then up to the blueberry trees, and finally, up to the overlook. I try to walk fast on the steep stuff. My legs are hurting. As painful as it is, I know when I hear the cheering it'll bring me home. Near the last corner I hear the finish. The bright sun as we come out of the trees. Onto the parking lot I hear familiar voices but it's all a blur as I just try to get to the line. Finally done! 1:18:48. Wow, that was tough. I'm toast. Besides it being a great training workout and character builder, the run also resulted in new resolutions for myself: 1. Prepare better 2. Get more sleep. Thanks, God, even for the rough days.